Honey is now sold. Thank you Susan! The lovely Honey is now on ebay! He's such a sweet little bear with big character. I'm starting him at £50, so lower than his original website price. Winter's ebay listing ends today! I've started him at £80.00 and his usual price is £120.00, which he will revert back to if he goes unsold. 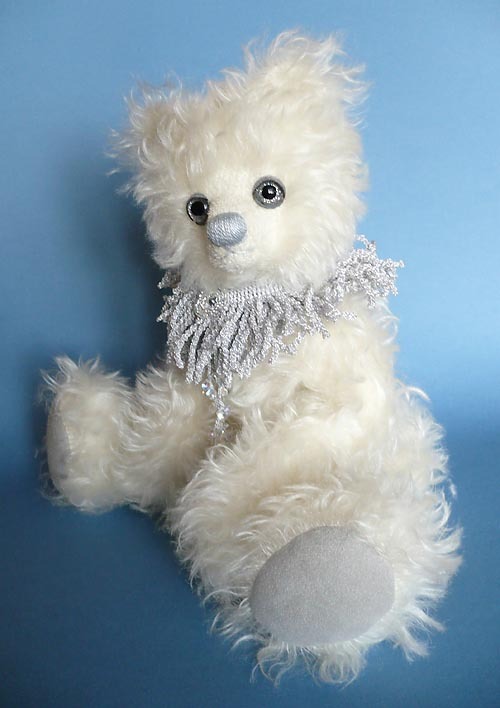 He's a very pretty bear and far more twinkly than his photos show! He's starting at £80.00 much lower than his website price. Hope you can visit him! I'm still busy working away. Spent this morning planting fruit trees! Well my Robert was digging the holes and I was tying them to their stakes and protecting them from the chickens! We have a Braeburn apple a Conference pear a Victoria plum and a Morello cherry. I don't hold out much hope for the cherries, as I think one of our resident squirrels will be quite partial to them, but you never know, he might have a savoury palate, rather than a sweet one. The weathers getting very chilly here in the UK, more the weather it should be this time of year. I did find the baking heat in October slightly disconcerting! Anyway, keep warm and happy! I'm a little late in posting this! BUT, better late than never. Acorn pictured above is now on ebay, until next Sunday the 9th. His listing is HERE. Many thanks if you decide to pop along and visit his listing. He's a bear full of character! Such a pretty mohair too. I have my thinking cap on for the TOBYS. 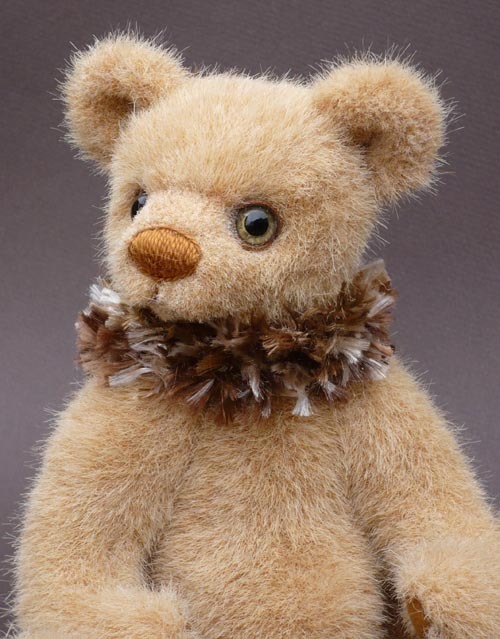 A rather prestigious worldwide teddy bear and soft sculpture competition. You see the need for the thinking cap? I've an idea for an entry and it's not a bear OR a rabbit. Come to think of it, I may need a lightbulb for that lightbulb moment, along with the thinking cap. Here in the UK we have been having a heatwave. Yes, in October. Tempretures are now swiftly dropping and we are due for snow. Acorn has sold. Thank you! It's been a long while since I have appeared in the Teddy Bear Times magazine. So you can imagine my delight when Faye of Teddy Bear Times asked me if I would like to write a piece in hand colouring eyes! She had seen a piece I had written for an online magazine. I was eagerly awaiting the magazine coming out and a little nervous at the same time! I flicked quickly through the pages in our local stationers and there it was. I rather liked the way it happened to co-ordinate with the front cover! It was almost like I had developed a sixth sense when I sent in that photo of one of the eyes I had completed! I must admit, it is strange to see your bears looking back at you from a magazine, when you are used to seeing them looking back at you through a computer screen or sat there in front of you in person! Anyway, a big 'thank you' to Faye! Peter Plum featured in the bottom left of the photos and Ashley, featured bottom far right, are still available from my website HERE . I hope my blog post finds you all well and happy.